This is the ULTIMATE dish to pair with a hot bowl of plain porridge, and I swear by it every single time I decide to cook porridge. I love this dish so much that I place its availability above all else -- if there isn't chai-po (the preserved turnip), there is NO need to cook porridge. No ands, ifs or buts about it. So let's discuss Preserved Turnip, or Chai-po as it is known in the Hokkien dialect. It is basically turnip that has been preserved or pickled in loads of salt and then finely chopped. As such, it is crazy salty and you have to soak them in water for at least 3 minutes before cooking. The texture of it is similar to any other vegetable that has been pickled: it is moist from being soaked with the pickling liquid, but crunchy at the same time. This is the only dish I myself use Chai-po for, although I know that the world famous Thai dish, Pad Thai, has this as a key ingredient. 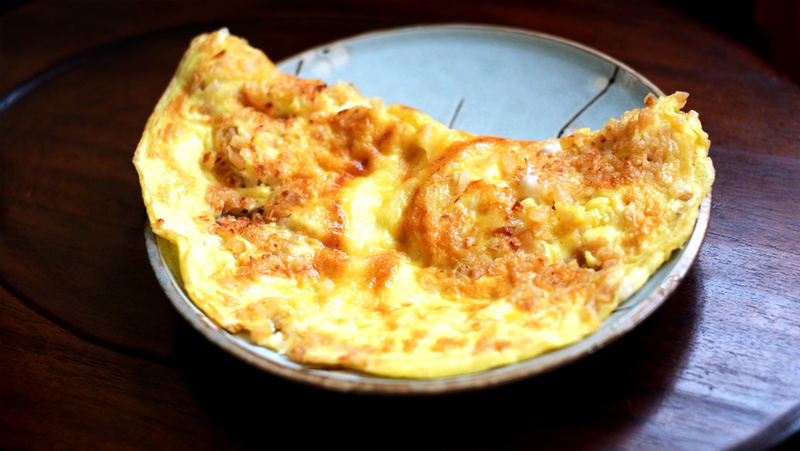 Because of its saltiness, there is no other way to eat Chai-po egg omelette other than with plain white porridge. Add a teaspoon of sugar to balance out the saltiness and it is a wonder on a plate. A few things to take note while cooking this egg omelette -- (1)be sure to completely break down the sugar molecules into the beaten egg mixture, otherwise you will get an omelette that is sweet only in certain parts, (2)do not be hasty in flipping the omelette (trust me on this) as it will break in the pan and the result is less than pretty and finally, (3) if you want a Chai-po egg omelette that is mad fluffy, throw in a couple of teaspoons of cornflour into the egg mixture and fry it with an additional tablespoon of oil, you will have the Spongebob Squarepants of egg omelettes because boy, will it expand, very exciting to watch, I have to say. The first thing to do is to soak the Chai-po (preserved turnip) in water. In the meantime, beat the eggs and the sugar together very thoroughly. Next, heat up the oil in a large skillet or wok. Drain the Chai-po of the water, squeezing as much water as you can out, and throw into the heated skillet or wok. Fry for about 20 seconds, before adding the egg mixture. Tip the skillet/wok to allow the egg mixture to spread out and lower the fire. Let the egg cook for a couple of minutes on one side, before flipping it for an additional minute on the other.